(42) S'rî S'uka said: 'Vasudeva having heard the words they spoke, chose for the sages as his priests and propitiated them by bowing his head. (43) The rishis being asked oh King, then engaged the pious soul in fire sacrifices that strictly to the principles with excellent arrangements were performed at the holy field [of Kurukshetra]. (44-45) When he was about to be initiated the Vrishnis came joyfully to the sacrificial pavilion, bathed and well-dressed, wearing garlands and being elaborately ornamented. They came together with their queens who, carrying the items of worship in their hands, were clad in the finest clothes, wore lockets around their necks and were smeared with sandalwood paste, oh King. (46) Clay tom-toms and tabors, kettle drums and drums, conch shells and other musical instruments sounded, male and female dancers danced and bards and panegyrists sweet voiced sang together with the female singers of heaven and their husbands. (47) According to the rules by the priests sprinkled with sacred water [for his initiation], Vasudeva with his eyes being decorated with collyrium and his body being smeared with fresh butter, together with his eighteen wives [see 9.24: 21-23 & 45] looked like the moon king surrounded by the stars. (48) With them all finely decorated wearing silk sârîs and bangles, necklaces, ankle bells and earrings he, being initiated and clad in deerskin, shone brilliantly. (49) Oh great King, his officials and priests radiated with their jewels and garments of silk as if they were standing in the sacrificial arena of the killer of Vritra [Indra, see 6.11]. (50) At that time the two Lords Râma and Krishna also stepped forward. With each of Them being accompanied by His own wives, sons and family members as expansions of Their glory, They shone just as splendidly. (51) Vasudeva exercised, in accordance with the rules, respect for the Lord of Rituals, Mantras and Paraphernalia, by performing [both the types of] fire sacrifices and such that are differently characterized as 'original' [or primary, different prototypes as described in the s'ruti] and 'changed' [or secondary, offerings following adapted procedures, see *4]. (52) Next he compensated at the designated time the priests, who were already richly decorated, with gifts of gratitude that decorated them even more, as also with marriageable girls, cows and land of great value. (53) After the great sages had executed the ritual with oblations by the sponsor and his wife [patni-samyâja] as also the concluding ritual [avabhrithya], the brahmins, with [Vasudeva] the chief of the yajña in front, bathed in the lake of Lord Paras'urâma [9.16: 18-19]. (54) Having bathed he together with the women gave their jewelry and clothing away to the bards and next in his finest apparel honored all the classes of people and even the dogs with food. (55-56) His relatives, their wives and children, the leaders of the Vidarbhas, Kos'alas, Kurus, Kâs'îs, Kekayas and Sriñjayas, the officials, the priests, the different types of enlightened souls, the ordinary humans, the paranormal souls ['the ghostly'], the forefathers and the venerable personalities he gave opulent gifts. Then they took leave from Krishna, the Abode of S'rî, and departed full of praise for the sacrifice that was performed. (57-58) The immediate family members Dhritarâshthra and his younger brother [Vidura], Prithâ and her sons [Arjuna, Bhîma and Yudhishthhira], Bhîshma, Drona, the twins [Nakula and Sahadeva], Nârada, Bhagavân Vyâsadeva and others embraced their friends and relatives, the Yadus, and then, with hearts melting of affection upon the separation, with difficulty returned to their respective places as also did the rest of the guests. (59) Nanda out of affection for his relatives stayed together with the cowherds [a little longer]. They were by Krishna, Balarâma, Ugrasena and the rest honored with extra opulent worship. (60) Vasudeva who with ease had crossed over the ocean of his great ambition [see also 10.3: 11-12], felt most satisfied. Surrounded by his well-wishers he took Nanda's hand and spoke to him. Third revised edition, loaded December 18, 2014. S'rî S'uka said: 'When Prithâ, the daughter of the king of Subala [Gândhârî] and Draupadî, Subhadrâ and the wives of the kings as also His gopîs, heard of the loving attachment [of the wives] to Krishna, Lord Hari, the Soul of All, they were all greatly amazed with tears filling their eyes. As the women thus were conversing with the women and the men with the men, sages arrived at the place eager to see Krishna and Râma: Dvaipâyana, Nârada, Cyavana, Devala and Asita; Vis'vâmitra, S'atânanda, Bharadvâja and Gautama; Lord Paras'urâma and his disciples, Vasishthha, Gâlava, Bhrigu, Pulastya and Kas'yapa; Atri, Mârkandeya and Brihaspati; Dvita, Trita, Ekata and the sons of Brahmâ [the four Kumâras] as also Angirâ, Agastya, Yâjñavalkya, sages like Vâmadeva and others. Seeing them the Pândavas, Krishna, Râma, the kings and others who sat down, immediately stood up to bow down to the souls who are honored throughout the universe. They all, including Balarâma and Acyuta, honored them befittingly with words of welcome, sitting places, water to wash their feet and water to drink, flower garlands, incense and sandalwood paste. With the sages sitting down comfortably the Supreme Lord, who in His embodiment defends the dharma, addressed that with rapt attention listening assembly of great souls. The Supreme Lord said: 'We who achieved this birth have now all obtained its fruit: the audience of the masters of yoga that even by the demigods is rarely won. How is it possible that human beings who are not very renounced and see God in the form of the temple deity, now may enjoy your company and may touch you, ask you questions, bow down and be of worship at your feet and such? By just seeing you, the saints, one is instantly purified, while that is not so with the holy places consisting of water or with the deities made of clay and stone that only after a long time make that happen [1.13: 10]. Neither the fire, the sun, the moon nor the firmament, neither the earth, the water, the ether, the breath, the speech nor the mind take, when they are worshiped, away the sins of someone entangled in material opposites. But they are wiped away by just a few moments of service to men of [brahminical] learning. S'rî S'uka said: 'Hearing this being said by Krishna, the Supreme Lord of Unlimited Wisdom, the scholars were silent, confounded by the words that were hard to digest. The sages pondered for some time over the Lord and the subordinate position [He had assumed] and concluded that what He had said was meant to enlighten the people. Thus they addressed Him, the Spiritual Master of the Universe, with a smile on their faces. The honorable sages said: 'Just see how we, the best knowers of the truth and chief creators of the universe, are bewildered by the power of the material illusion created by the activities of the Supreme Lord, who so amazingly covert in His operations pretends to be the one controlled. Effortlessly He creates, all by Himself, the variety of this universe and maintains and destroys it without getting entangled Himself. He is in His actions just like the earth element with the many names and forms of its transformations. What an actor [imitator] the Almighty One is in His activities [see also 8.6: 10]! Your good Self, the Original Personality of the Soul, nonetheless at times assume the mode of goodness in order to protect Your people and to chastise the wicked; it is the mode in which You maintain the eternal Vedic path of the varnâs'rama divisions [of status/vocational orientations] by means of Your pastimes [see also sanâtana dharma]. The Spirit of the Absolute [as known by the Vedas] is Your pure heart wherein the manifest, the unmanifest and the transcendental position is realized by means of austerities, study and turning inward in concentrated meditation [see also B.G. 7: 5]. Oh Absolute Truth, You show Your respect for the community of the brahmins because one by means of those perfect representatives can understand the revealed scriptures. Consequently You are the leader of all souls of respect for the brahminical culture. Today we achieve the fulfillment of our birth, education, austerities and vision, for it is the goal of the saintly souls to find association with You, the Ultimate of all Welfare. We offer [You] Krishna our obeisances, You, the Supreme Lord whose wisdom is always fresh, the Supersoul who covers His greatness with His yogamâyâ. None of these kings who enjoy Your company, nor the Vrishnis, know You hiding behind the curtain of mâyâ, as the Supreme Soul, the Time and the Lord [B.G. 6: 26]. The way a sleeping person, who envisions an alternate reality with names and forms, in what he manifests through his mind does not know of a separate reality beyond it, does one with You similarly having names and forms, have no clue because of the discontinuity of one's memory that is created by the activity of the senses that bewilder one's consciousness with Your mâyâ [compare B.G. 4: 5 and 4.29: 1, 10.1: 41 and 7.7: 25]. S'ri S'uka said: 'The sages having said this took leave of Das'ârha [Krishna], Dhritarâshthra and Yudhishthhira, oh sage among kings, and prepared to return to their hermitages. Seeing this the greatly renown Vasudeva [the father of Krishna] approached them and bowing down took hold of their feet while expressing the following, carefully chosen words. S'rî Nârada said: 'Oh scholars, this question asked by Vasudeva in his eagerness to learn about his ultimate benefit, is not that surprising at all considering the fact that he thinks of Krishna as being a child [of his, his son]. When people are close in this world, it is easily a cause of disregard, just as it is e.g. with someone living at the Ganges who leaves to seek purification elsewhere. 'It has been ascertained as being correct that karma is counteracted by this [type of] work: to worship with faith and with festive sacrifices Vishnu, the Lord of All Sacrifices. Scholars demonstrated from the viewpoint of the S'âstras that this religiousness of being connected [in yoga] is the easiest way to pacify the mind; it brings joy to the heart. For the twice-born soul at home in worship of the Personality of Godhead to perform sacrifices faithfully with spotlessly [justly] acquired possessions, constitutes the path that brings success [**]. An intelligent person should renounce the desire for wealth by means of sacrifices and charity. He should give up the desire for a wife and kids by engaging in temple affairs. With the help of [the cakra order of] Time [and also as being the destroyer of all worlds, see also 9.5 and B.G. 3: 16] he should forget the desire for a world for himself, oh Vasudeva. All sages renounced their [three types of] desires for a household life and went into the forest for doing penances [see also B.G. 2: 13]. Prabhu, a twice-born soul is born with three debts: a debt to the gods, a debt to the sages and a debt to the forefathers. Not liquidating them by [respectively] sacrifice, studying the scriptures and by begetting children [also pupils and brainchildren like books, see ***] he, upon leaving the body, will fall down [back into the material world]. But you [Vasudeva] are presently free from two of the debts, the debt to the sages and the debt to the forefathers, oh magnanimous soul. Be now free from your debt to the gods and renounce your homestead. S'rî S'uka said: 'Vasudeva having heard the words they spoke, chose for the sages as his priests and propitiated them by bowing his head. The rishis being asked, oh King, then engaged the pious soul in fire sacrifices that strictly to the principles with excellent arrangements were performed at the holy field [of Kurukshetra]. When he was about to be initiated the Vrishnis came joyfully to the sacrificial pavilion, bathed and well-dressed, wearing garlands and being elaborately ornamented. They came together with their queens who, carrying the items of worship in their hands, were clad in the finest clothes, wore lockets around their necks and were smeared with sandalwood paste, oh King. Clay tom-toms and tabors, kettle drums and drums, conch shells and other musical instruments sounded, male and female dancers danced and bards and panegyrists sweet voiced sang together with the female singers of heaven and their husbands. According to the rules by the priests sprinkled with sacred water [for his initiation], Vasudeva with his eyes being decorated with collyrium and his body being smeared with fresh butter, together with his eighteen wives [see 9.24: 21-23 & 45] looked like the moon king surrounded by the stars. With them all finely decorated wearing silk sârîs and bangles, necklaces, ankle bells and earrings he, being initiated and clad in deerskin, shone brilliantly. Oh great King, his officials and priests radiated with their jewels and garments of silk as if they were standing in the sacrificial arena of the killer of Vritra [Indra, see 6.11]. At that time the two Lords Râma and Krishna also stepped forward. With each of Them being accompanied by His own wives, sons and family members as expansions of Their glory, They shone just as splendidly. Vasudeva exercised, in accordance with the rules, respect for the Lord of Rituals, Mantras and Paraphernalia, by performing [both the types of] fire sacrifices and such that are differently characterized as 'original' [or primary, different prototypes as described in the s'ruti] and 'changed' [or secondary, offerings following adapted procedures, see *4]. Next he compensated at the designated time the priests, who were already richly decorated, with gifts of gratitude that decorated them even more, as also with marriageable girls, cows and land of great value. After the great sages had executed the ritual with oblations by the sponsor and his wife [patni-samyâja] as also the concluding ritual [avabhrithya], the brahmins, with [Vasudeva] the chief of the yajña in front, bathed in the lake of Lord Paras'urâma [9.16: 18-19]. Having bathed he together with the women gave their jewelry and clothing away to the bards and next in his finest apparel honored all the classes of people and even the dogs with food. 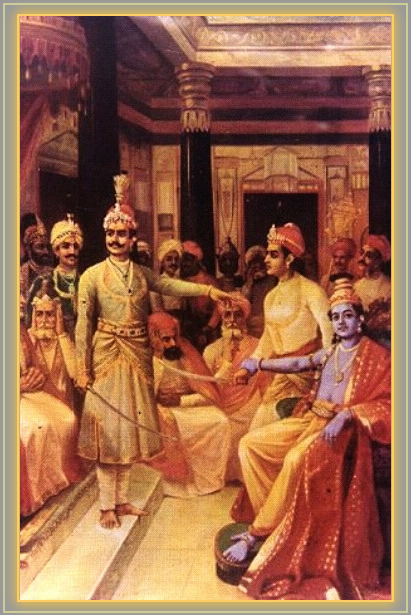 His relatives, their wives and children, the leaders of the Vidarbhas, Kos'alas, Kurus, Kâs'îs, Kekayas and Sriñjayas, the officials, the priests, the different types of enlightened souls, the ordinary humans, the paranormal souls ['the ghostly'], the forefathers and the venerable personalities he gave opulent gifts. Then they took leave from Krishna, the Abode of S'rî, and departed full of praise for the sacrifice that was performed. The immediate family members Dhritarâshthra and his younger brother [Vidura], Prithâ and her sons [Arjuna, Bhîma and Yudhishthhira], Bhîshma, Drona, the twins [Nakula and Sahadeva], Nârada, Bhagavân Vyâsadeva and others embraced their friends and relatives, the Yadus, and then, with hearts melting of affection upon the separation, with difficulty returned to their respective places as also did the rest of the guests. Nanda out of affection for his relatives stayed together with the cowherds [a little longer]. They were by Krishna, Balarâma, Ugrasena and the rest honored with extra opulent worship. Vasudeva who with ease had crossed over the ocean of his great ambition [see also 10.3: 11-12], felt most satisfied. Surrounded by his well-wishers he took Nanda's hand and spoke to him. S'rî Vasudeva said: 'The by God forged bond of men called affection is, I think, even for heroes and yogis difficult to give up. Even though the friendship you offered so very saintly has not been reciprocated by us, being so forgetful of what you did, it will never cease, for it is beyond compare. Formerly [sitting in Kamsa's prison] we could not act on your behalf and now, well-to-do oh brother, we even with you standing in front of us fail to see you because our eyes are blinded being intoxicated by our opulence. S'rî S'uka said: 'Thus with tears filling his eyes remembering what he [Nanda] all had done in his friendship, Ânakadundubhi, with his heart softened by the intimacy, had to weep. Out of love for his friend who showed his affection and for Krishna and Râma, Nanda then said: 'I will go later, I will go tomorrow', but stayed three months longer with the Yadus who honored him. Being satisfied with desirables like the most valuable ornaments, finest linen and various priceless pieces of furniture, he accepted the gifts that were offered by Vasudeva, Ugrasena, Krishna, Uddhava and others. Seen off by the Yadus, he departed together with the inhabitants of Vraja and his family. As they went to Mathurâ, Nanda, the gopas and the gopîs could not put Govinda's lotus feet out of their minds and consequently looked back [many a time]. With their relatives having departed the Vrishnis, who had Krishna as their deity, saw that the rainy season was about to begin and therefore turned back to Dvârakâ. *: This statement, so reminds the paramparâ, is confirmed in the authoritative s'ruti-mantras, that declare 'yâvatîr vai devatâs tâh sarvâ veda-vidi brâhmane vasanti': "Whatever demigods exist, all reside in a brâhmana who knows the Veda." ***: The word putra used here usually refers to a child, but also means doll or any other artificial thing to care for like a home, or works of art, a book or another byproduct as Prabhupâda and his pupils called it as e.g. in 3.28: 38 and 11.20: 27-28. It literally means 'preserving from the hell called Put', the place where the childless ones reside. the Kurus attempting to prevent war " is by Raja Ravi Varma.